There are about 24 million people in Australia. There are more than 44 million kangaroos. Even when you add in the nearly 7 million tourists that visit each year, the ‘roos have us outnumbered. In most other countries, potential tourists might be put off from visiting Australia, fearing spiders, snakes, and jellyfish that could kill you, but they will usually be excited to take a selfie with a cute marsupial. For example, tourists flock to the area around Morisset Hospital in Lake Macquarie, New South Wales, for a chance to meet the large population of friendly and inquisitive kangaroos who live there. Search Instagram for Morisset Park, and you will see hundreds of photos of cute kangaroos allowing people to get close enough to take selfies with them, even to share a nibble of carrot. There is, however, a downside to this influx of roo-tourism. The growing number of human visitors, bringing human food, and reducing the natural wariness kangaroos may have of humans, has resulted in increased incidents of aggression, and even documented attacks. It's become such a concern that an Australian politician has started to take action. Australian MP Greg Piper called for signs in multiple languages warning that kangaroos can cause injuries, and should not be fed, to be installed in the grounds back in May. 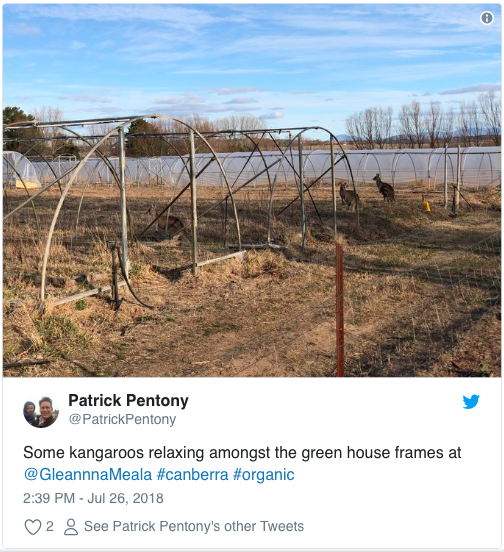 This month, hoards of wild kangaroos have descended up the capital city of Canberra, in search of food, due to a severe shortage caused by the recent cold, dry weather. "Canberra is experiencing a perfect storm of hardship for its kangaroos. New records have been set in Canberra for very cold, frosty nights this winter. This, coupled with very dry conditions with very little rain at all in June and July, means there is very little food for kangaroos, " said Australian Capital Territory Parks and Conservation Service Director Daniel Iglesias. This temporary population growth has also led to a record number of crashes in the suburbs involving the bouncing marsupials, as there have already been 2,291 incidents so far this year - compared with 2,634 in the whole of 2017. Along with the growing number of motor incidents, locals and tourists alike need to be cautious around the animals as they became a more familiar sight. Added Iglesias, “People should never approach a 'roo to pat or feed it -- it will inevitably mistake your well meaning advances and you risk it striking out in self-defense." No solution has yet been found to the 'roo-dilemma. As always, wild animals should be treated with caution in any environment, as they are unpredictable, no matter how cute and fuzzy they may be. Maybe the moral of the story is that literally everything in Australia could kill you. Newer PostSoIll Teams Up With TOMS & 1Climb To Get More Kids Climbing!